1. Preheat the oven to 220ºC, gas mark 7. Place the asparagus and halved tomatoes in a roasting tin, scatter with a tablespoon of the oil, garlic, cumin and seasoning. Roast for 15 minutes until slightly charred. 2. While the asparagus is cooking, place the lentils and bay leaves in a pan with enough cold water to cover generously. Bring to the boil and simmer for 15 minutes until just tender. Drain and remove the bay leaves. 3. Place the remaining oil, vinegar and seasoning in a bowl. Add the drained warm lentils, parsley, pine nuts, onion, warm tomatoes and roasted asparagus. 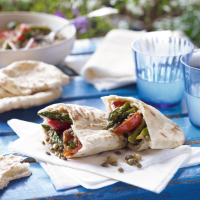 Toss gently together and serve warm or at room temperature piled into pittas.